Let me repeat again: If you have read somewhere that Qatar has abolished the peculiar labor law (system) that binds all workers in the Gulf country to a Kafeel (a sponsor), called Kafala, IT IS NOT TRUE! I tweeted a link to the Human Rights Watch (HRW) report from November 2015, which describes, in detail, the relevant contents of the new law unveiled that fall but only came into effect this month as per their implementation timeline. After doing that, I wondered if this reporting was considerably more widespread since I had seen the same kind of wording in articles I had read earlier. And yet, the article went on to describe how rights workers are saying that there has been NO change in the system, forget about abolishing it! 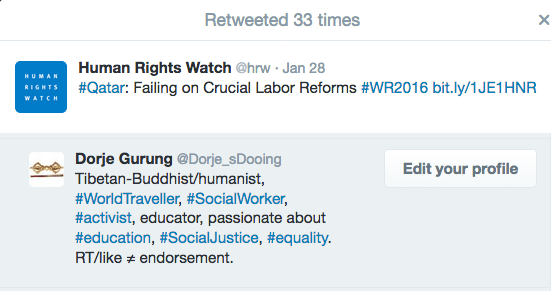 Here too, I had tweeted a link to the HRW report from November 2015 describing the issues with the new law. My Republica’s sister publication Nagarik News also had a Nepali version of the same news, headling “Kafala ends in Qatar, how does that affect The Nepalese?” I tweeted drawing their attention to the HRW report. The Kantipur Post, however, had written a considerably more accurate article on the subject, which I shared with Nagarik News and the author of their article.
.@nagarik_news @Mdkoirala Or read this Kathmandu post article for details. @hrw https://t.co/v8KjKXVtrv? The Kantipur Post journalist appears to have actually done his homework contacting rights workers and getting feedfack from them. Here’s a quote from the article. Sure enough, pretty much every article published on — or since — December 13 uses the word “abolished” or “abolishes” in their headline! One article that came out this month, however, goes into the details of the issues with the law. Published in Dohanews.co, on Dec. 13, it headlined Rights groups skeptical as new labor reforms take effect in Qatar. HRW followed up their November report with another one in January 2016. Here’s the most important paragraph from the report. 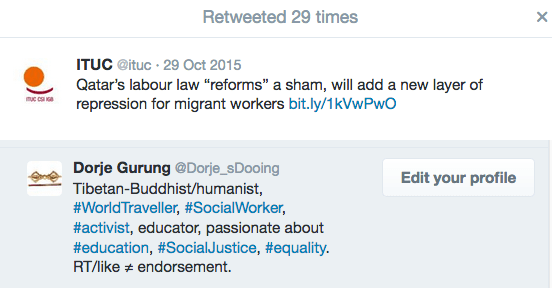 So, the point is, Qatar has NOT abolished the Kafala system. The reason for the interest of the Nepalese in the labor laws in Qatar is the presence of half a million of our fellow citizens in the country, a significant number of whom suffer all the time, many of them from the Kafala system. It was the Kafala system that trapped Roshan Kumar for more than a decade in a deportation center! It was the Kafala system that trapped these Nepalese worker in an untenable situation. It was the Kafala system that prevented the Nepalese in Qatar from returning home to tend to their families in the aftermath of the April 25 and May 12 earthquakes last year. I rely on them because I have a some history with some of them. Dohanews is the online Qatar paper which, by breaking my story of my incarceration in Doha back in 2013, initiated the beginning of the end to my ordeal! Shabina Khatri did that write-up as well as a couple more about me and my ordeal, which helped spread the word of my predicament around the world. Nicholas, Vani, James and Aakash were involved in rescuing Roshan Kumar from his nightmare! After publishing his story, I got in touch with all of them, including Shabina, via Twitter, and they managed to get Kumar out of Qatar within a month! And of course, if you read some of the articles, you would have also noticed that a couple of them were the ones quoted. Follow them and trust them to produce and provide reliable news about what’s going on with labor-related issues in the region. Dohanews reports that two recent changes have been introduced to the new law. The first change reverts the law back to how it used to be: expats need permission from employer to leave the country. The second, an improvement from before, expats who want to quit their jobs and leave has recourse: they can petition “the grievance committee” for help, instead of simply absconding and being an illegal as was the case in the past for lack of options. ← F*ck the Beach; Mount Everest!